When this quilt square is sunlit it can tell you the time! The science of making sundials is known as gnomonics, because the part of the sundial that casts the shadow is called the gnomon. “Gnomon” (pronounced “no-mon”) is an ancient Greek word that means “indicator” or “that which reveals.” Some have called the gnomon the gnome that knows the time! In the case of our Quilt Square sundial the gnomon is the steel rod sticking out from the dial face. In order for the gnomon to cast the proper shadow it must be aligned parallel to the Earth’s rotational axis. In other words, the top end of the gnomon must point toward the north celestial pole, very close to Polaris, “the north star.” This means that the gnomon is aligned with true north and south, and also that the upward tilt of the gnomon from horizontal is equal to the latitude of the sundial’s location. This particular type of sundial is known as a “vertical south declining” sundial—meaning that the dial face is vertical and faces generally south but not exactly south. The exact direction the sundial faces (which in this case is the same direction the wall faces) is a critical factor in the design of any vertical sundial, and is known as the declination of the dial. To measure this angle I designed and built a special purpose sundial called a “declinometer”, which indicates the angle of the wall by comparing it with the azimuth of the Sun. In this way I determined that the south wall of the Yancey Common Times Journal building faces 2.9 degrees west of south, or 182.9 degrees azimuth. In order for this type of sundial to function properly and accurately it must be specifically designed for the location where it will be used, taking into account both the latitude and the longitude of that particular location. As mentioned above, the tilt of the gnomon depends on the latitude, but the positions of the time markings on the dial’s face are determined by both the latitude and the longitude. (Note: This is why mass produced sundials are unlikely to function properly—because the tilt of the gnomon and the layout of the hour markings aren’t right for the specific place where the sundial is being used.) For this sundial I determined the latitude and longitude of the Yancey Common Times Journal building using Google Earth, and then verified the result using standard topographical maps. The location of the sundial is latitude 35.918° N.; longitude 82.299° W.
Based on those latitude, longitude, and declination values I then found the hour and half hour line angles for the dial face, and also the angles and dimensions of the gnomon. The mathematics used for this is High School level trigonometry, and can be done on a pocket calculator. To verify my numbers I checked them against several sundial generating computer programs. The end result of these calculations is a projection onto the face of the sundial of the plane of the Sun’s apparent motion across the sky. The nature of this projection can be seen on the sundial in the way the hour lines are slightly closer together at midday and more spread out in the morning and evening. Using the angles and dimensions calculated above I then built a scale model of our quilt square sundial, a small test dial to check that the sundial would really work as designed. When I temporarily placed it on the wall at the Yancey Common Times Journal building and checked it against my “atomic” clock, I was very happy to see that it was indicating the correct solar time, within one minute of the time I expected to see! Once I was satisfied with the accuracy of my hour angles I passed them along to Martin Webster, along with the data for the Equation of Time graph and star map, to use as the basis for his design of the quilt pattern on the sundial. The steel frame behind the sundial is there to move the sundial out of the shadow of the roof overhang, and was built for us by Altec Industries in Burnsville. The gnomon was built to my design by Brisco Machining in Swanannoa. 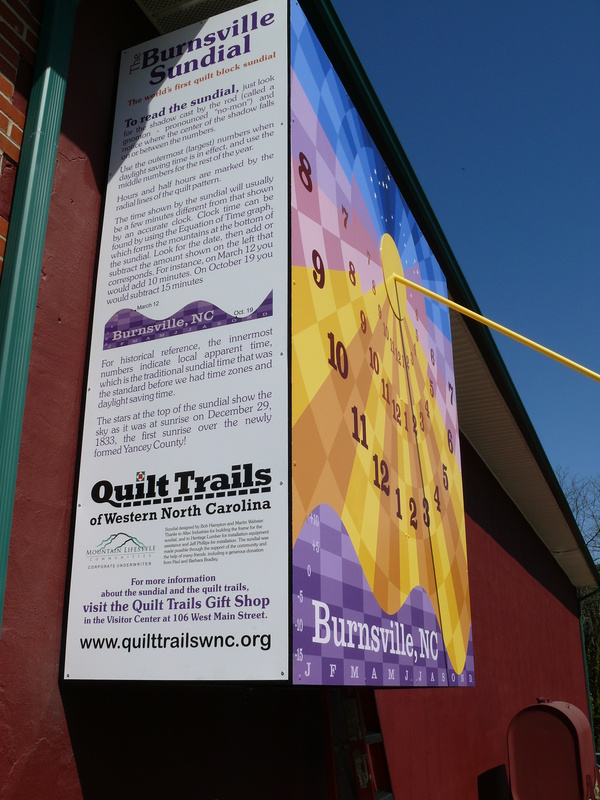 Posted on March 9, 2011, in Barn Quilt Champions., Barn Quilt Trails., Quilt block patterns., What's the impact? and tagged burnsville, gnomonics, north carolina, sun dial. Bookmark the permalink. Leave a comment.